 What do men want? Not more wilderness weekends with Robert Bly but closer relationships with their mothers, according to this challenging and compelling study of mother/son relationships. Ever since the Greek goddess Thetis clung too tightly to her infant son, Achilles, and left him the unfortunate legacy of the Achilles heel, mothers have been warned to keep their hands off their sons. If you want your son to grow up to be manly and heroic, so the experts from Freud to Spock counsel, you must not hover, you must let go. 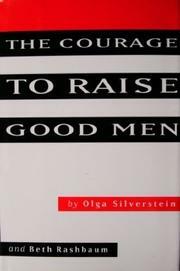 But Silverstein, drawing from her 35-year practice as a family therapist as well as her own experiences as a mother, contends that this not-so-benign neglect is responsible for the lion's share of men's problems--for ``lost boys, lonely men, lousy marriages, midlife crises.'' While an expanding civilization may once have required men to separate from their mothers and wives and sail off alone in search of the Golden Fleece, the rules have changed. The frontiers men must cross are internal rather than external. We require men who are brainy rather than brawny, men in touch with the feminine, nurturing parts of themselves and who can protect us from environmental disaster and nuclear annihilation. But even though we no longer need men to slay dragons, we remain trapped in Robert Bly-esque mythologies of masculinity and heroism. Even today, when 25 percent of children under 18 are living in households headed by single women, many mothers, doubting their capacity to be role models, continue to search for father figures for their sons. If mothers trusted their abilities to nurture their sons, to help them become kinder, gentler people, the world would be a better place, Silverstein argues. Literate, perceptive, and provocative--sure to heat up the fires of the gender debate.